A new analysis from the Kaiser Family Foundation estimates that 1.5 million people with pre-existing conditions could face higher premiums under an amendment suggested by Sen. Ted Cruz to the Better Care Reconciliation Act (BCRA), the Senate’s proposed replacement for the Affordable Care Act (ACA). The amendment, which is being discussed but has not been introduced, reportedly would allow insurers in the non-group market to sell some policies that don’t follow all ACA market rules – including the requirement to provide coverage for ACA-defined essential health benefits, such as maternity care, drugs to treat cancer or HIV, or therapies to treat mental health and substance abuse disorders. Without the essential health benefits requirement for some plans, ACA-compliant plans would attract sicker people who need those benefits, while more healthy people would purchase non-compliant plans. In addition, some reports suggest non-compliant plans could turn people down or charge them more based on health status. As a result, premiums for compliant plans would rise significantly, while premiums for non-compliant plans would be substantially lower. Under the Senate health bill, people with incomes below 350 percent of the federal poverty level are eligible for tax credits to defray premium costs; people with incomes above this threshold who have pre-existing conditions would be at risk of paying full, unaffordable rates for plans that covered their health needs. 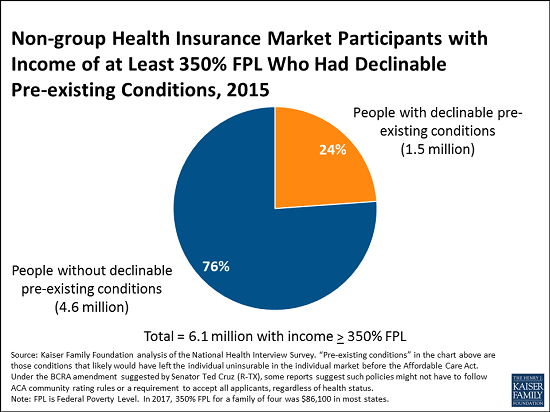 The new Foundation analysis estimates that 1.5 million people in the non-group insurance market with incomes of 350 percent of the federal poverty level or higher had a pre-existing condition that would have been considered automatically deniable by insurers prior to the ACA. If these individuals could buy cheaper, non-compliant plans, they could still be left with unaffordable medical bills for uncovered care. Millions of others could have other types of pre-existing conditions that were not considered automatically declinable.